Yasuyuki launches the remotely controlled UAVWe enjoyed a fun Geolunch presentation yesterday, where Ben Burford of ISTS America and Yasuyuki Watabe and Masaki Usami from ISTS Japan showed off a new aerial photography system. This lightweight camera system is able to capture centimeter resolution image data at a fraction of the weight and cost of a traditional aerial photography system. They’ve also developed software that can automatically orthorectify these acquired images with only the photos, gps location of the camera, and camera information. 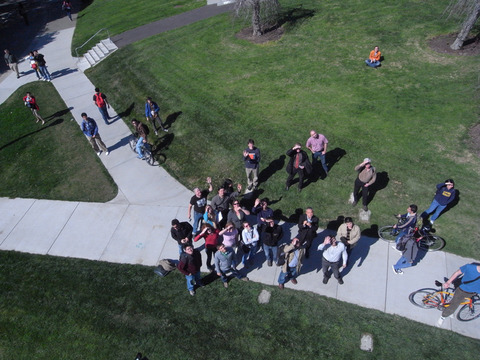 After presenting their systems capabilities in a slideshow presentation, the developers showed off their UAV with a live demo outside of Mulford Hall!